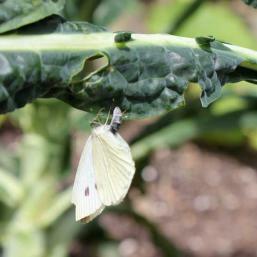 Cabbage white butterflies are common in our gardens between spring and autumn. They are the only white butterfly you are likely to see so this alone makes them easy to indentify. 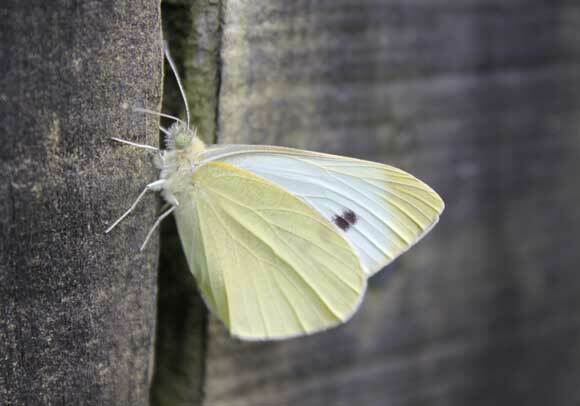 Adult butterflies have creamy-white coloured leaves with black dots on them. 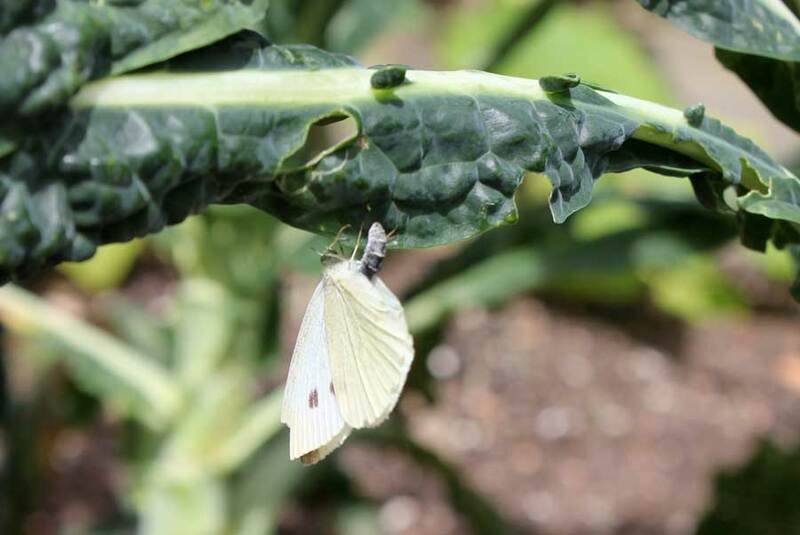 Cabbage white butterflies target cabbages, broccoli, cauliflower and other members of the brassica family such as rocket. They lay yellow, bullet-shaped eggs on the underside of leaves. 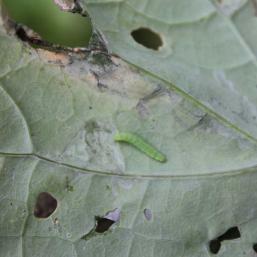 These hatch into green caterpillars that are the destructive part of the Cabbage white’s lifecycle. The young, pale yellowish green caterpillars start life very small and rapidly increase in size as they feed on the plant they hatched out onto. Their colour intensifies to a darker green and they develop a faint orange/yellow stripe along their side. By the time the have finished growing and are ready to pupate and emerge as adult butterflies they are about half the length of your little finger and almost as thick as a pencil. The caterpillar forms a white, silky chrysalis in the soil or on a woody plant stems and within a couple of weeks hatches into an adult butterfly ready to lay more eggs. 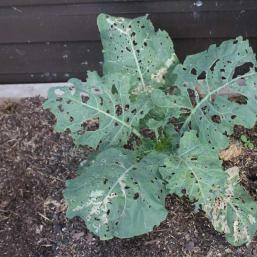 Plants affected by Cabbage white butterflies soon start to look like a piece of Swiss cheese. Leave are covered with holes. Young plants can die and large plants become weakened and vulnerable to other pests and diseases with crops and harvests poor. At the end of summer, any remaining caterpillars will form a chrysalis and this will remain tucked away through winter before a new adult hatches in the spring and begins a new cycle in your garden. Adults: The butterflies are fairly fast flyers and will leave a plant they are perched on as you approach them so it can be hard to target them. You may be successful if you whack at them with a badminton racket or a fishing net. Plants can be protected with fine mesh netting. Scattering broken eggshells around the base of your plants is said to deter butterflies from landing on what they believe to be plants that are already infested with other butterflies. Planting nasturtiums near your brassicas draws Cabbage white butterflies away from your plants, they will lay on the naturtiums that can then be removed and composted along with eggs and caterpillars. 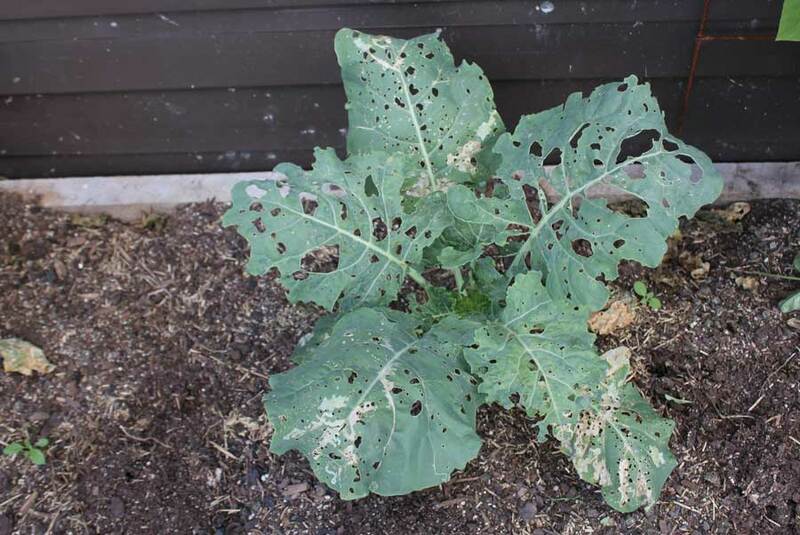 Eggs: If you have the time to check the underside of outer leaves on your brassica plants eggs are fairly easy to spot and can be rubbed off. 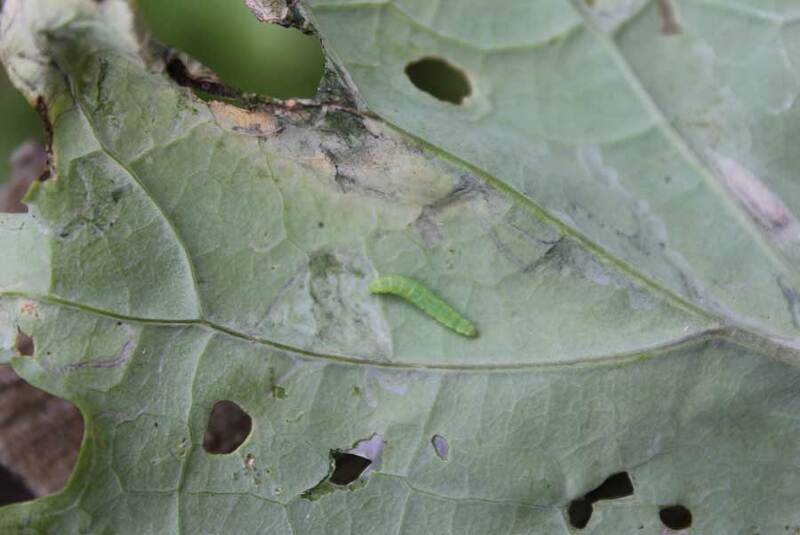 Larvae/caterpillars: The small green caterpillars can be spotted on the underside of leaves as they nibble pale areas and channels out of the surface. 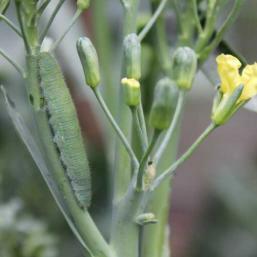 The larger more mature caterpillars are often harder to see as they take on a darker, more plant-like green. I have found they appear on the center or heart of plants – often at night when it’s dark. Take a torch out and see what’s happening if you are not encountering them during daytime searches. Dusting plants with household flower when foliage is damp causes caterpillars to get clogged and fall off. 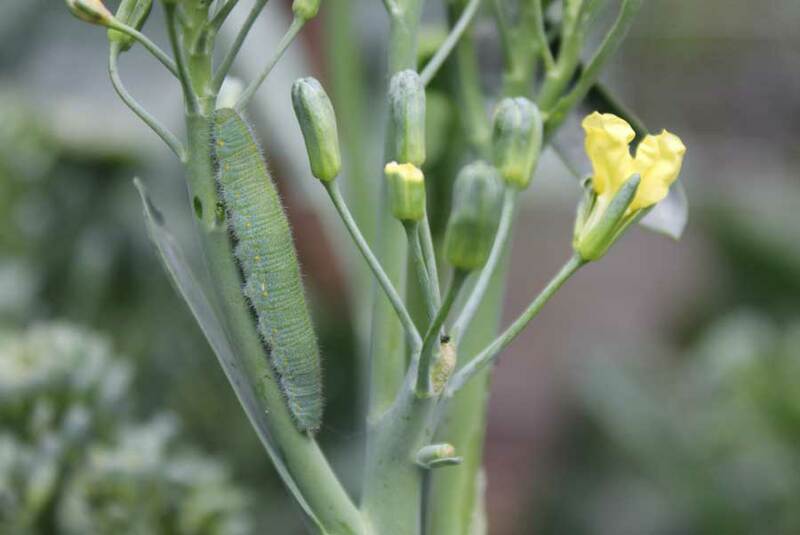 Birds eat caterpillars so put a bird bath amongst your brassicas to encourage them in.